Beijing has Shandong,Sichuan, Jiangsu and Zhejiang, and Guangdong cuisine, as well as well-prepared court and vegetarian cuisine. 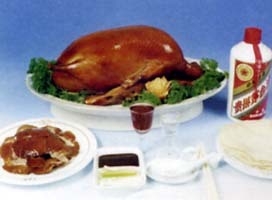 Beijing cuisine was developed on the basis of Shandong, court and official cuisine. Beijing is also well known for its court and Muslim's snacks, such as pea cakes, bean flour cakes and shaomai (a steamed dumpling with the dough gathered at the top).